Then there is an image of the Sydney Exhibition Building, circa 1890s. 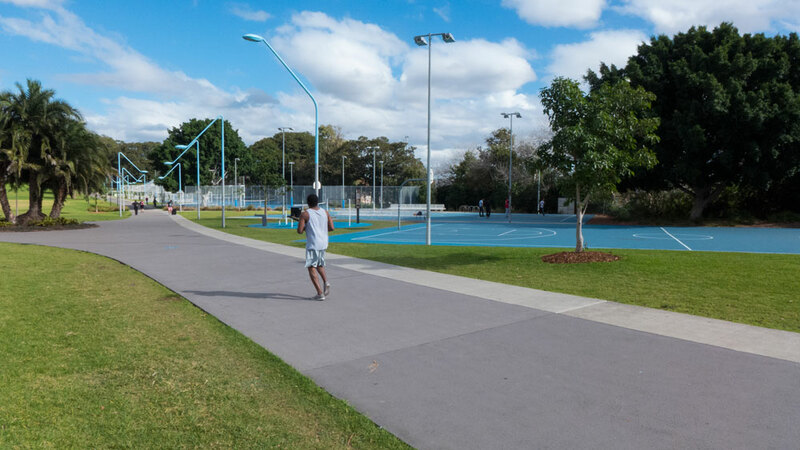 In my research on the recent park improvements for Prince Alfred Park I saw mention that the Sydney City Council rejected the original architects plan as this would have meant too much encroachment on the present valuable open space. Well done City Council. I think the influence of Clover Moore, Lord Mayor, is evident in that decision. 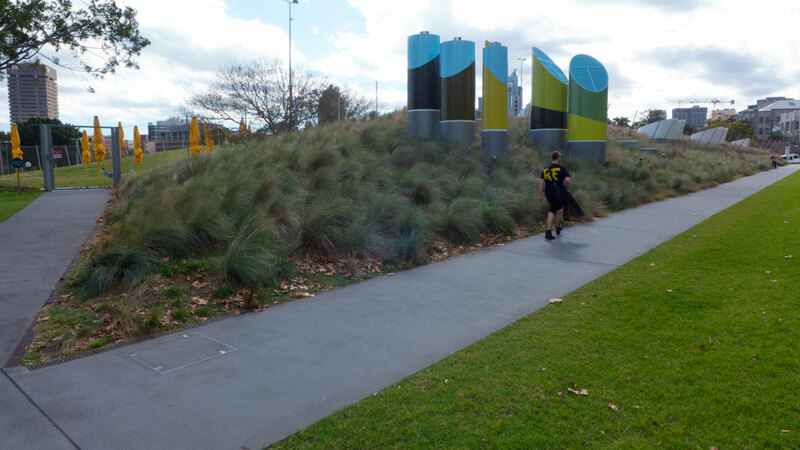 During my visit to Prince Alfred Park it was obvious that most of the parklands have been improved with some new enhancements but essentially the main parkland continues to be a large traditional and beautiful open space for the inner city residents. 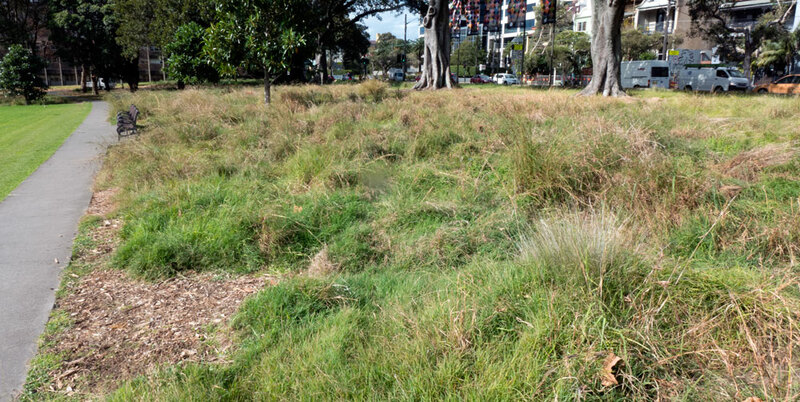 At the top of Prince Alfred Park near the extremely busy Cleveland Street, the very old trees remain with the addition of a buffer of some new grasses between the top path and the street. It is shame that more seats were not provided here as this high point is a natural gathering and meeting point for residents. 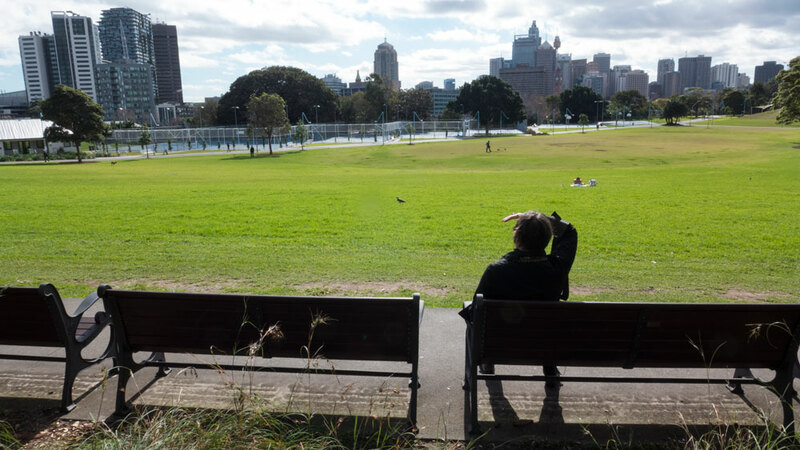 The view over Prince Alfred Park to the city is to be enjoyed. So my request, on behave of the many park lovers, please provide more seats. Down to the right from this point there is a couple of lines of magnificent trees under which there are some seats and one barbecue. That’s all good. But it would seem that the city council has not provided enough seating around these trees so that more groups of people could simultaneously spend time in the shade of these wonderful trees. I would have to suggest that a couple more barbeque spots would have been logical. 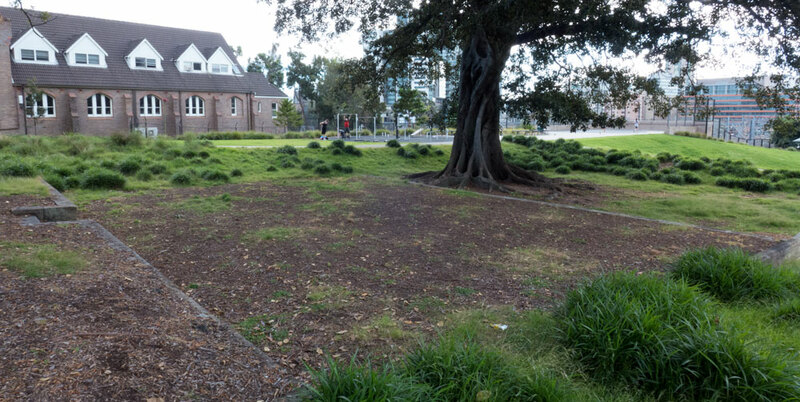 In general the seating around Prince Alfred Park, besides at the lower Chalmers St entrance, is quite sparse given that parks are places people love to venture into and take time out by themselves or in groups and there’s nothing like having generous seating being provided across many locations within such a park. Around the park are numerous small play areas which is a very good thing given that parents will appreciate as it means there are options for their children to play in. It also means that they can avoid play areas that become dominated by other groups, strange persons (see below), or even people with nuisance dogs. 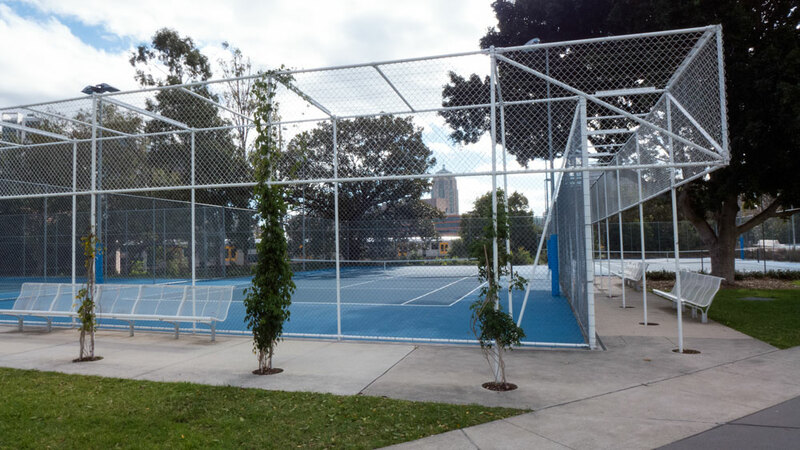 There are also activity spots with exercise equipment and a number of tennis courts. 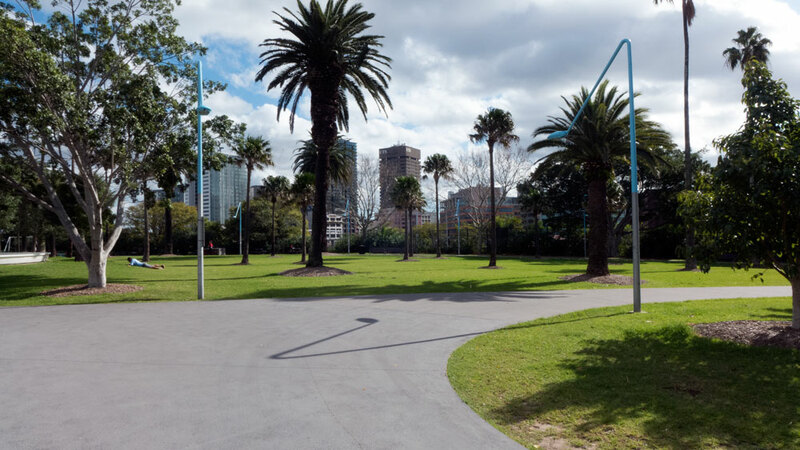 All this is very wise as it brings people into Prince Alfred Park for a variety of reasons and the more people who come into the park, then the safer people feel about walking through and just taking time out alone somewhere in the open spaces. There’s an effort at green wall or coverage around the tennis courts that may be too early to judge just yet. That is, I hope this was not a year’s growth that was on display. For now the perimeter of the tennis courts remains functional but unattractive. Much has been made of the new lights in the media statements and the professional comments online. Nice touch I agree, but let’s not get carried away about how wonderful they are. 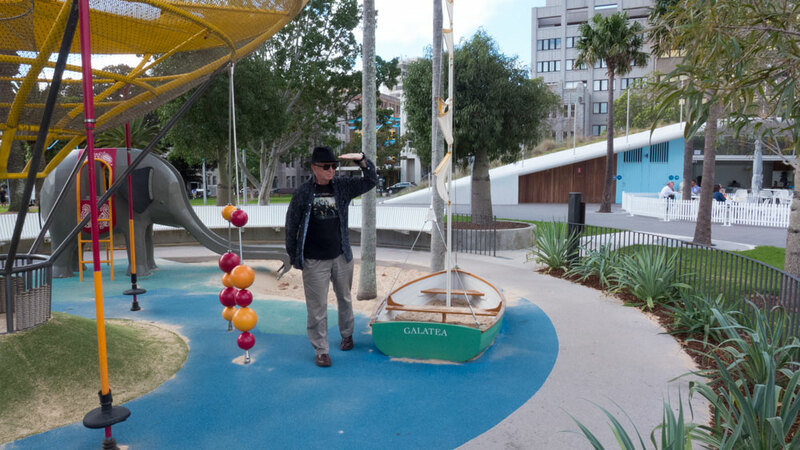 What actually brought my attention to this park was the publicity around May 2013 when it was announced that Prince Alfred Park had been upgraded and that a new swimming pool had been constructed. The pool area is significant at the lower end of the park. The pool replaces a former one that I was not familiar with, so can offer no comment on it. 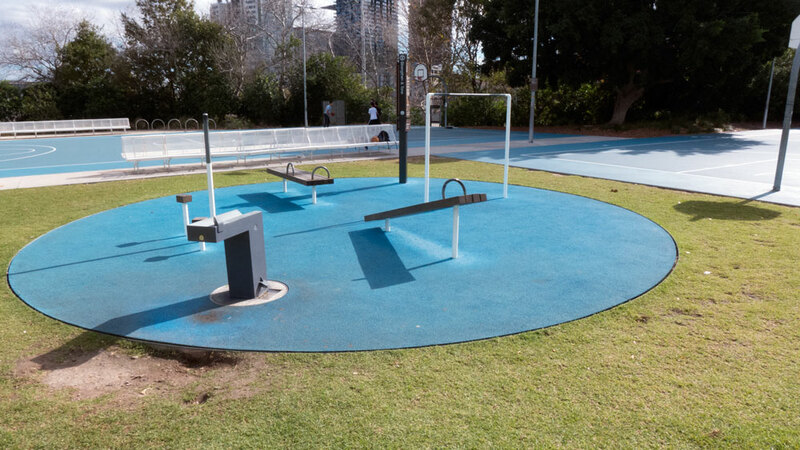 However much of the publicity has focused on the new pool buildings, the associated facilities and the surround landscape works in Prince Alfred Park. The architecture of the swimming pool building and pool area is quite good. Not sure why they had to make it look like some Gold Coast poolside, but I will leave that question out there. As to the basic shape and fit out, again it is fine, but nothing special for the early part of the 21st Century. The power generation is standard at the moment but this will be upgraded later by the City Council along with many more such initiatives across Sydney. Clover Moore and the council are to be congratulated for their plans to address climate change adaptation. 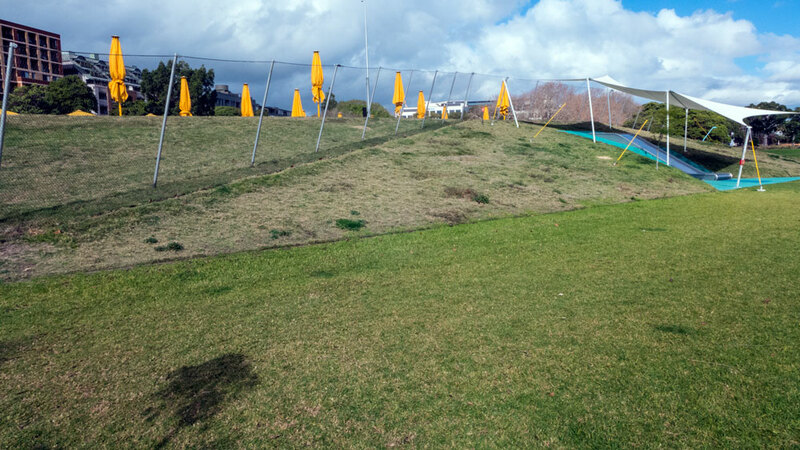 Now for something silly – here’s a quote from the architects for Prince Alfred Park: Transparent mesh fencing to the enclosure is playful and ephemeral, dancing around and on top of the mounds and building. The cranked alignment of the building and angular geometries of the grass mounds, resonate with the triangular geometries of the park, local subdivision patterns and local building profiles. I saw this fence before I had read the architect’s words online. My view when I saw it remains the same as it does now when I look at it in my photographs. The wire fence is actually quite ugly. Any amount of architectural spin does not improve its dreadful aesthetic effect on the whole pool site. 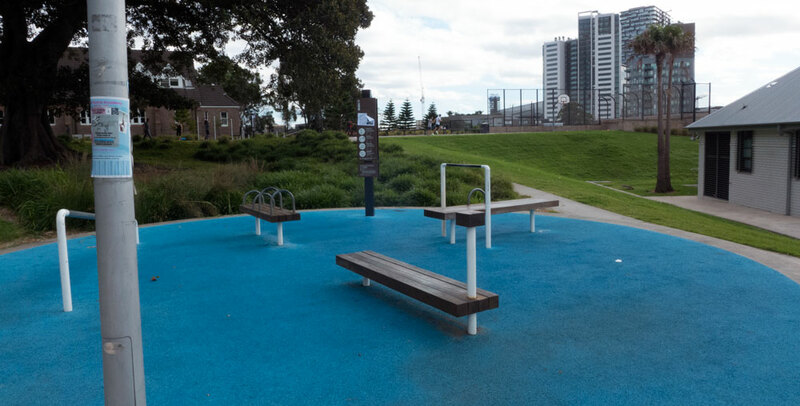 It is shame that no-one could have not come up with something more appropriate and elegant for an historic place such as Prince Alfred Park. 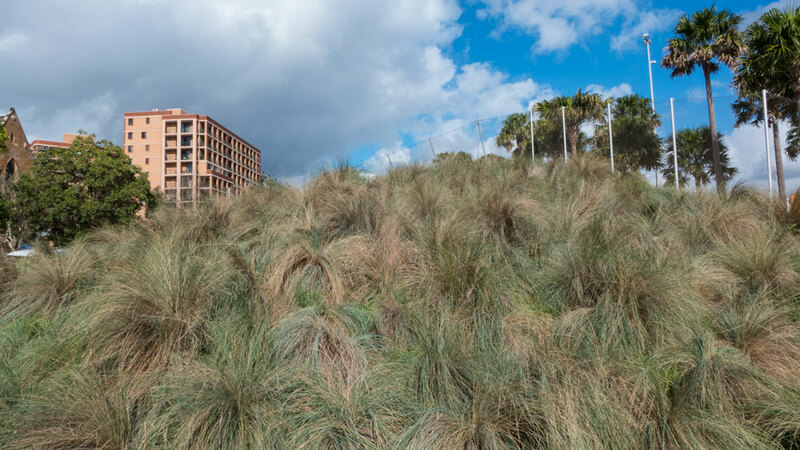 As to the latter comments – The cranked alignment of the building and angular geometries of the grass mounds, resonate with the triangular geometries of the park, local subdivision patterns and local building profiles . What a load of marketing spin – or simply crap! The whole building is low and look very nautical which in no way reflects or ‘resonates’ with the very urban neighbourhood. I must point out two glaring faults with the site. The first is the wooden panels on the front of the pool pavilion that are just one year old. They look to be much older as they are already in terrible condition. Poor choice of materials I suspect. The other little surprise was the condition of the new grass mound on the western side as it joined with the grass of the main parkland. The grass on the mound was struggling and in contrast to the more established grass, looked a mess. Bad soil or wrong plants? Not sure. And then there’s that extensive wire cage again! What a stupid and awful looking solution. The eastern side of the pool pavilion is covered with a mound with lots of beautiful grasses on it. A lot was made of this treatment in the promotional material by the architectural firm involved. Sorry to be just a little negative, but yes it is good work, but not rocket science. This standard of work should now be standard and is not something to be raved about or honoured in any special way. As for all those colourful ventilation stacks? Again fine, but nothing too special for this central city location. Likewise much is being made of the yellow umbrellas. OK – they are yellow umbrellas. What else is there to say – except get over it! 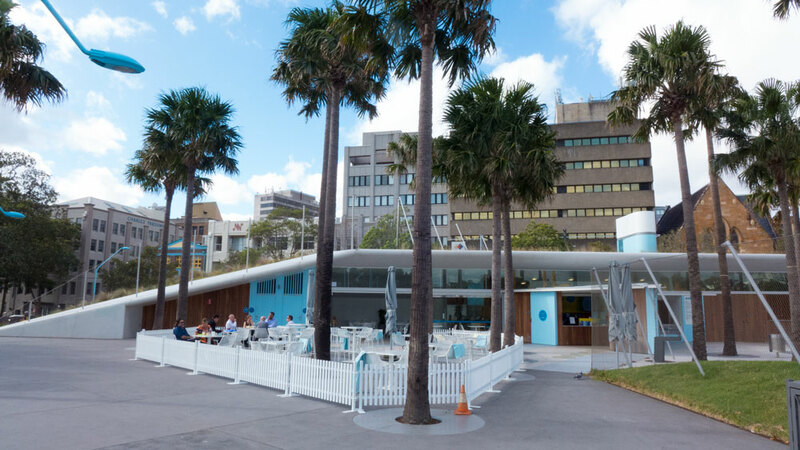 The Prince Alfred Park cafe is very nice an serves good food and coffee. It is recommended. Friendly service and very nice lunches. 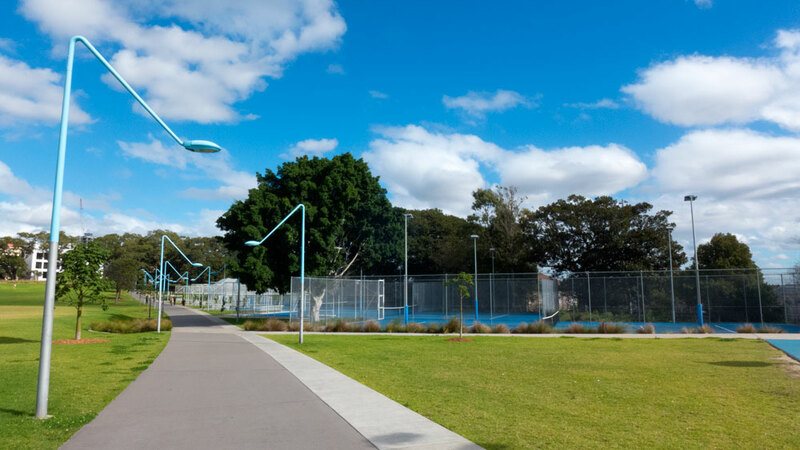 Despite the few too many faults as delivered by the architectural teams involved, Prince Alfred Park is a park that the city should be proud of. I am sure the workers nearby and the locals enjoy it a lot. They were starting to arrive as we left and many of the seats at this end, off Chalmers St, were taken as people came out to enjoy the sunny winter day in Sydney. A quick park incident. When we were having our lunch we were joined at the next table by several people who immediately filled the air-waves with their loud conversations. I now know more about theatrical make-up than I needed to know while trying to enjoy the good food and coffee at the Prince Alfred Park cafe. The three people were then joined by the CEO for the City of Sydney. The coincidence is that I know Monica from when she was a very serious and caring theatre person in Canberra. Listening to her equally loud voice as part of this group, I suspect she has changed. And yes, she did not recognise me. Has it been that long since we were both poorly paid and overworked arts people in Canberra? Such is life’s little mysteries and how people change as they climb that corporate ladder. For us, we finished up quickly and left as the quietness of art galleries was beckoning.